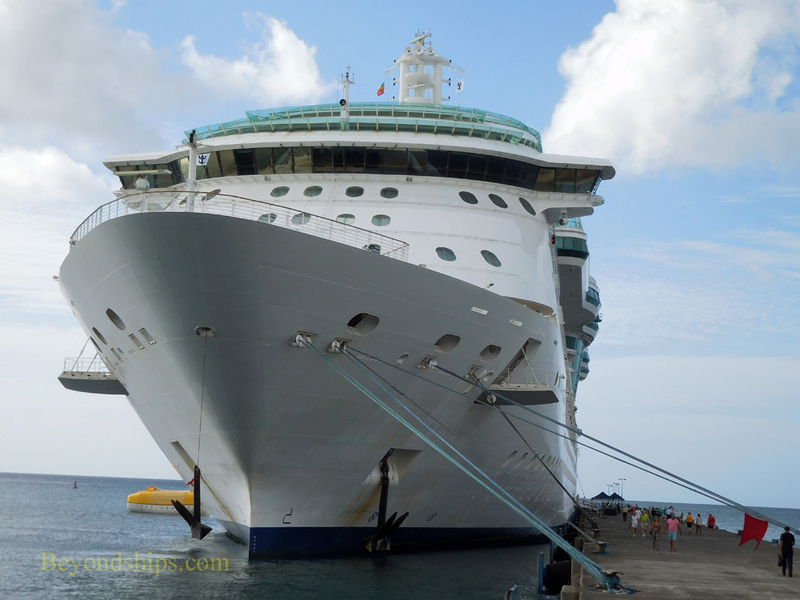 Royal Caribbean's Radiance class, of which Serenade of the Seas is the third one they built, are elegant ships. Not elegant in the sense of being formal but rather elegant in the same way that a fine European sports car is elegant. They have a lot of power and are highly maneuverable. Plus, there has been attention to detail and quality throughout. In addition, they are a nice size, small enough to have an intimate feel and yet large enough to house a good number of facilities and amenities. This was an 11-day southern Caribbean cruise leaving from Fort Lauderdale. The Radiance class ships have been described as explorer ships in that they often are used to blaze a trail to see whether the conditions and demand for visits to a particular port warrant the deployment of a larger vessel. Consistent with this role, the itinerary included both well-established ports (e.g., Aruba and Barbados) and ports that are not frequented as often on cruise ship itineraries such as Grenada and Bonaire. Quite a few of the passengers that I spoke with indicated that this mix of ports attracted them to the cruise. By far, the majority of the passengers were adults, primarily of the Baby Boom era. Inasmuch as this was a longer cruise taking place while school was in session, there were very few children - - some 70 out of more than 2,000 passengers. Many of the passengers were experienced cruisers. The upper tiers of Royal Caribbean's were well-represented with quite a few Pinnacle level members. Some said that they only travel on this class of ship rather than RCI's larger ships. Serenade does have a cozy atmosphere. It is not difficult to get around the ship. In addition, the use of wood finishes combined with large expanses of glass make her visually pleasing. After the Oasis class ships went into service, Royal Caribbean decided to roll back some of the features of the Oasis ships into its existing fleet. With the Radiance class, this primarily involved adding more dining options to the ships. Serenade had her refit in 2012 and so offers a good range of specialty dining experiences. I tried several of these dining alternatives. In place of one of the card rooms, Serenade now has a small dining room dedicated to the Chef's Table Experience. A dozen or so guests are seated around a long, polished wood table and are treated to a multi-course dinner with wine pairings. The chef who prepared the meal explains each course as it is brought to the table and the sommelier/waiter describes each of the wines. It is not only a sophisticated meal but is conducive to good conversation. Serenade had a Chops Grille steakhouse even before the Oasis re-fit. It is hard to go wrong with Chops, premium quality beef, nice side dishes and a sophisticated but relaxed atmosphere. On Serenade, I was also quite impressed by the friendly service. Next door is Giovanni's Table, which replaced the Portofino's, which was part of Serenade's original equipment. Less formal than Portofino's, Giovanni's offers a menu of Italian-inspired dishes. I found the filet mignon with Gorganzola sauce particularly pleasing. Also added to Serenade were a small Rita's Cantina (Mexican) and an Izumi (Asian). Izumi took over the space that had been occupied by the Seaview Cafe. As I was a great fan of the Seaview Cafe, I do regret this change. One addition to the list of complimentary venues that I quite enjoyed was the Park Cafe in the enclosed Solarium pool area. For lunch, it has a counter with a variety of sandwiches including a carving offering. But the real winner is the salad counter where a staff member will make a fresh salad to order. The list of ingredients you can select from is more limited than the Tutti Salad bar offered during lunch in the main dining room but it is still sufficient to create a meal-sized salad. As the main dining room is only open for lunch on sea days, the Park Cafe is an attractive venue for those looking for light, healthy salad on port days. The Oasis refit also changed Serenade's entertainment venues. Chief among these was the conversion of the Centrum into an entertainment venue. Theme parties, dancing and instrumental concerts take place here. In addition, the Centrum was also rigged for use by aerialists in the Wow Shows. A technical problem resulted in no aerialist performancess during this voyage. However, I did not really miss them as their novelty has worn off now that so many ships have such performances. The cinemas on some of the larger Royal Caribbean ships were removed during their Oasis refits but thankfully this did not happen on Serenade. It is not a large room but the seats are arranged in steep terraces so that a good number of people can see the films. Several showings of recent films were offered each day and were well-attended even on port days. The shows in the main theater included reviews by the ship's production cast as well as shows by visiting performers including comedians, magicians and singers. One night, the theater was used as a movie theater and on Thanksgiving it showed broadcasts of a number of football games. There was no enrichment program to speak of during this voyage. No outside port lecturers or presentations on history or current events. For mental stimulation, the ship is equipped with some interesting works in its permanent art collection. During the first two days of the cruise, Serenade encountered weather that caused passengers to talk about the rough seas. However, Serenade handled it well as demonstrated by the fact that the passengers were still out and about the ship enjoying its facilities. When the seas are really rough, you do not see large numbers of people out and about. As noted earlier, Serenade has good nautical qualities.